Oh happy day!! Today is release day for True Bias's newest pattern! 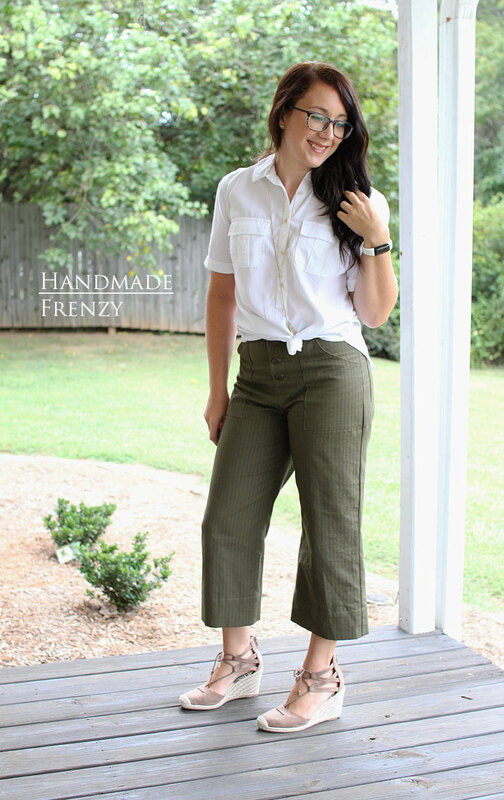 The Lander Pant and Short. 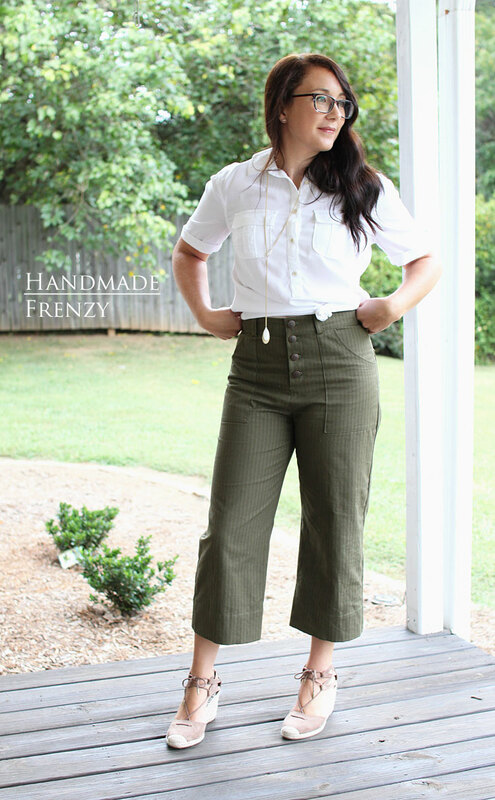 *From the pattern description: The Lander Pant and Short includes front and back patch pockets, belt loops, and a straight fit through the legs. 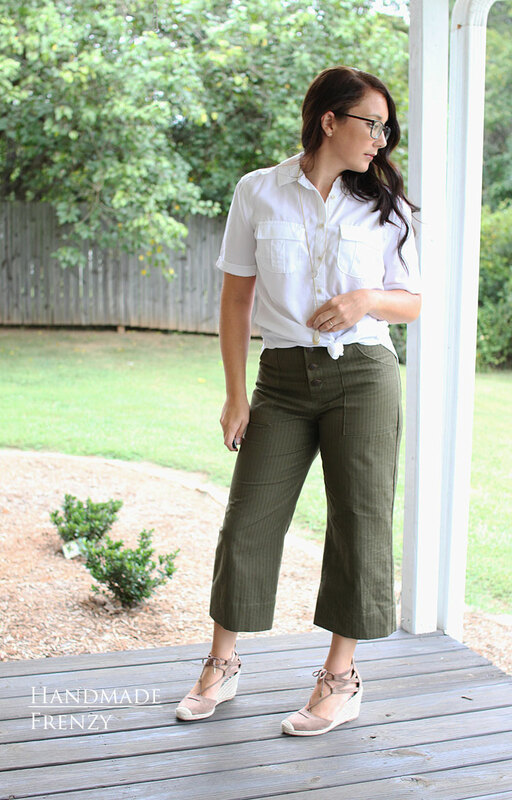 View A is a short with a 4" inseam, View B is an ankle length pant, and View C is a boot length pant that can be worn with a heel. I am finding myself in a sort of style transition, personally. I am being drawn to colors that I haven't been before, and I'm taking steps out of my comfort zone as far as styling goes as well. 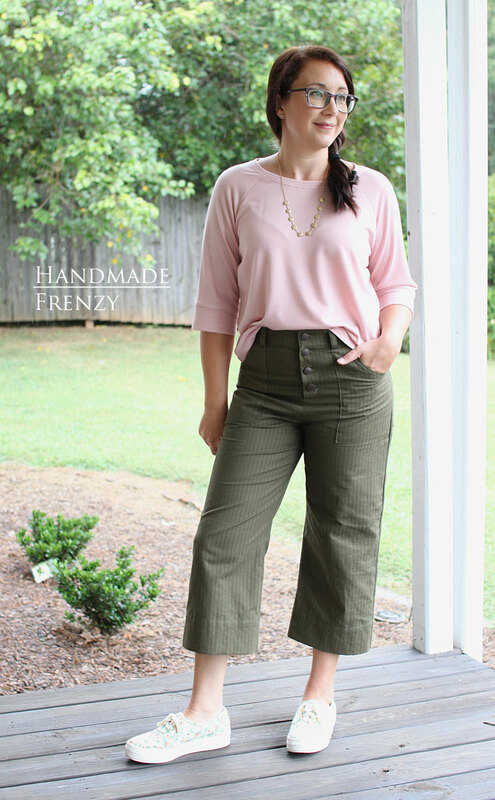 So when Kelli asked if I would like to test this pattern, as soon as I saw the high waist, I was all in! I've been wanting to try this style for quite a while and just hadn't jumped on it yet. That being said, once they were sewn up, I did struggle a little bit on how to style them. But once I stopped thinking about it so hard, and just *wore* them, I found out that I had a lot in my wardrobe already that paired really well! 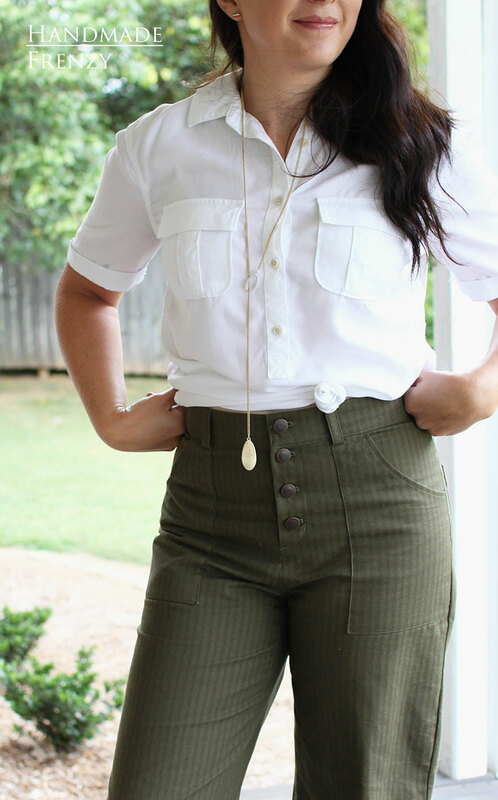 I found that it wasn't so much the high waist that I had an issue with as the wide leg. 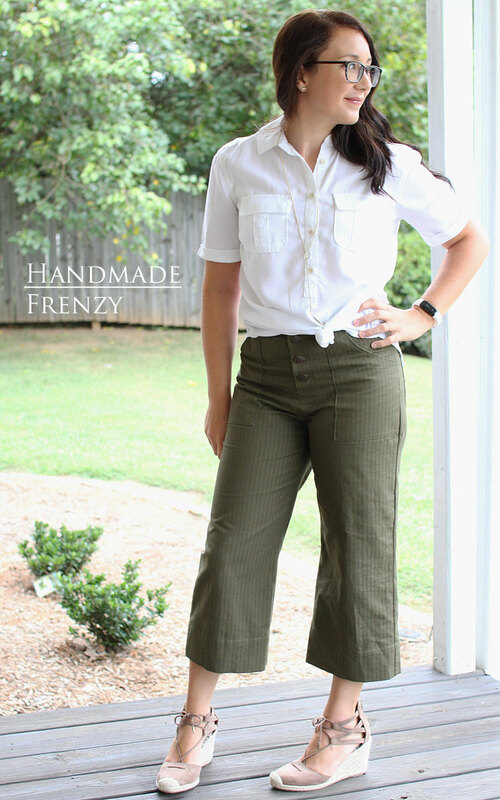 I'm not used to that style of pant, but balanced with the right top and shoe proportions it definitely works! My fabric choice here has something to do with how wide the legs seem/feel to me. Since this was a tester version, I used a "tester" fabric, if ya know what I mean. Lol. This is a very stiff twill of some sort that I grabbed a while ago in the Joann's red tag bin. I can't wait to sew these up in a fabric with some more drape. I think it will cause the legs to drape more and take some of the wide look out of the lower part of the leg. You can see in Kelli's samples (hello gorgeous) what I mean by that. 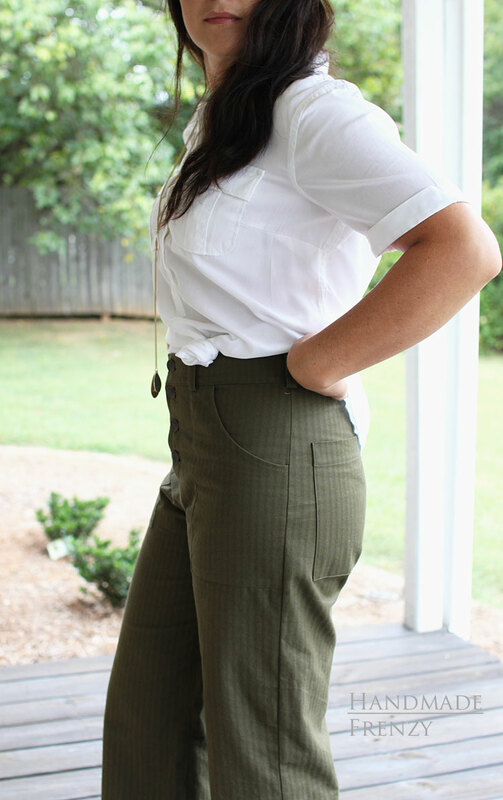 She used Kaufman Ventana Twill for her samples, and obviously, this is a perfect choice! For my next pair, I'm planning to use a linen/rayon blend. Super excited to see how those will turn out!! I'm also planning to make a pair of shorts in some stretch denim. YAS. So let's dive in to some of the construction and fitting details, shall we? This being the tester version, there are a couple of changes made to the fit. The main thing being that the crotch was scooped out a little more in both the front and back. This is reflected in my version you see here, but I also added a bit to the front crotch length and I think that was unnecessary. 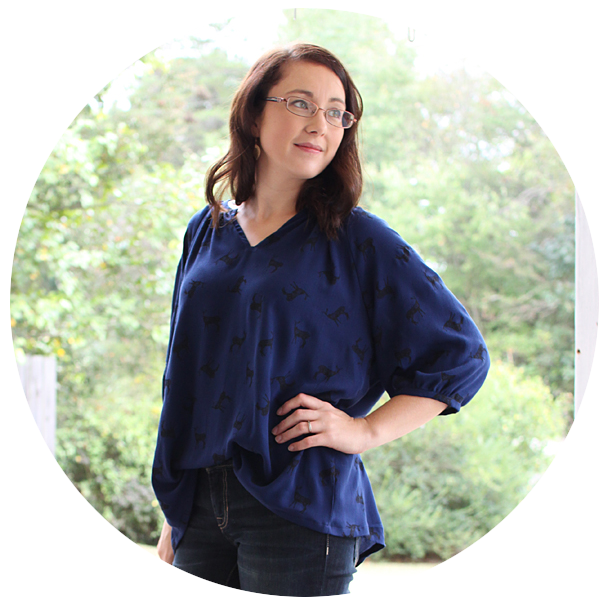 If you choose to sew up this pattern (I mean, you really SHOULD! 😄), I would definitely recommend making a muslin. That's not a step you should skip with this style of pants! She also added a bit of wiggle room in the seam allowance through the hips. My muslin version had absolutely zero stretch, so I needed to let the side seams out a bit that time. My final version that you see here was sewn up exactly as per the pattern, so fabric content will play a part in the fit here. I did shorten the hem by 2 inches, because, short. But that's a super easy mod to make. The bottom of the pants are straight, so taking them up a couple of inches isn't an issue, next time I will take that length out at the lengthen and shorten line to keep the proportions a little better. 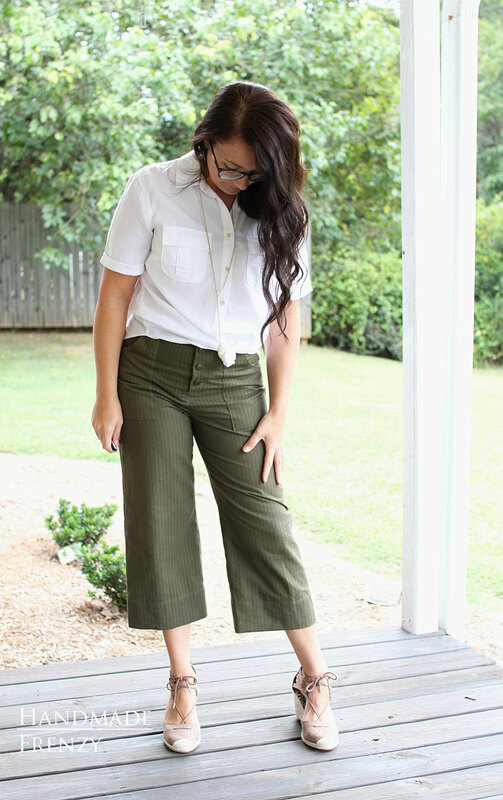 I love, love, love, the dressed up look with the crisp white shirt and wedges. But like I said, I played around with styling and made a cropped Linden sweatshirt to wear with it as well. 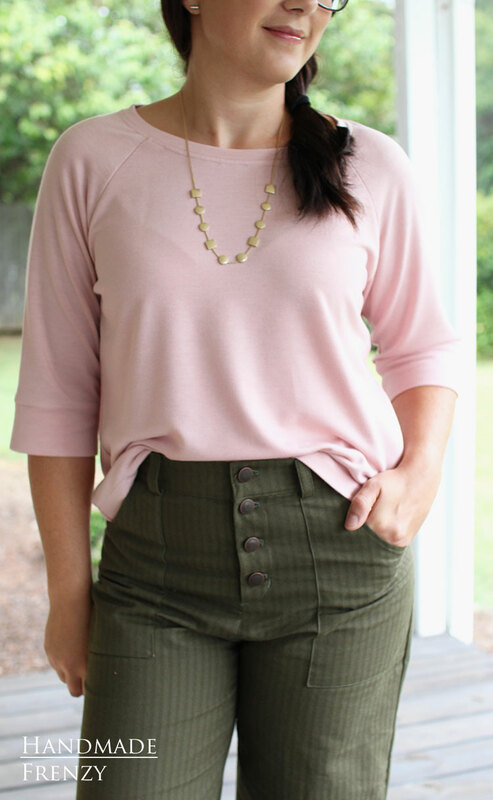 The high-waist, plus cropped sweatshirt length is perfection! I paired it with my Rifle Paper Co Keds, because the colors are absolutely perfect, but I'm not 100% sure I'm sold on the chunky sneaker look with the pants. Maybe sandals would be better? Either way, it's cool today and I'm wearing this look with the sneakers anyway, haha. 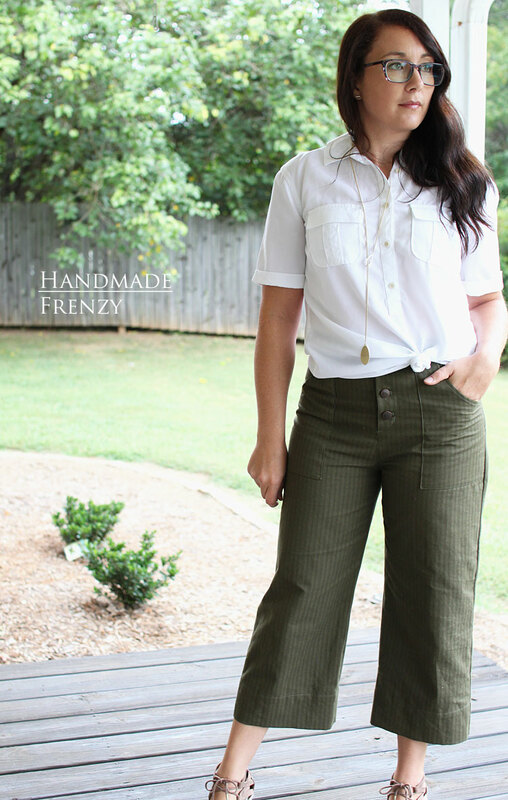 All in all, I can't wait to make up another pair of these cropped pants, they are on my sewing list for this month. 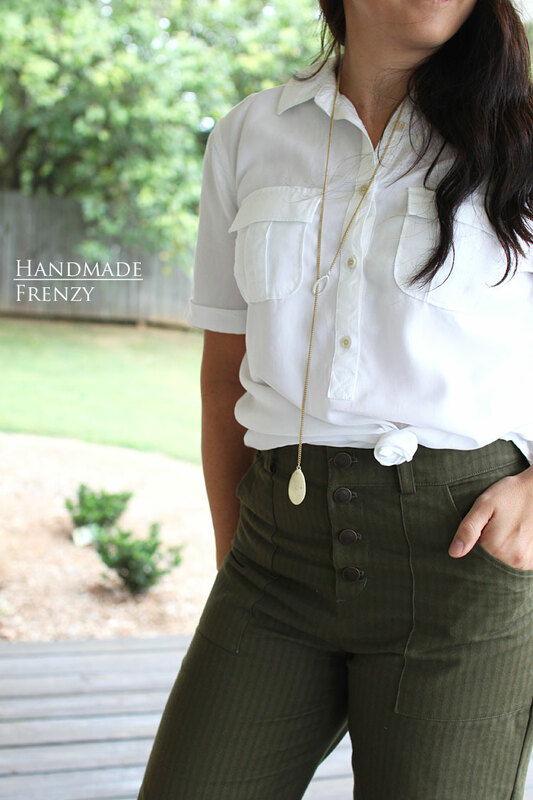 But I'm seriously dying to make a pair of the shorts, even if the weather seems to be getting too cool for them! We have been known to get a heat wave in October here, so who knows, maybe I'll just go for it. Wow! 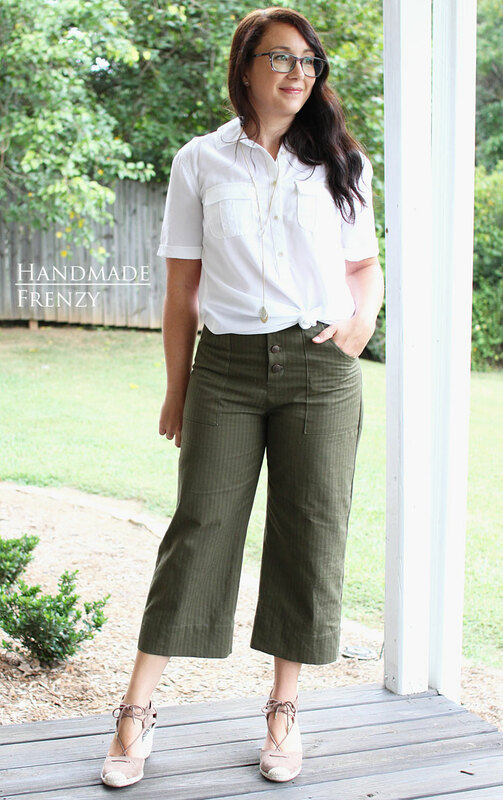 Love how you styled the pants - I'm a big fan of wide-leg trousers! Oh yay great make. I haven't visited before but I found these pants on Instagram. I am puzzling ouut if I want to buy the pattern or not, tho leaning towards yes after reading this. I think both looks work great.